Total: 12 hr 15 Min. | Active: 15 Min. The original recipe with guaranteed success is for 2 litres. Altering the number of portions may result in alternate results. Please note that the existing quantities are not automatically adjusted in the text. Bring the milk and sugar to the boil, stir until the sugar has dissolved. Pour the milk into the ice cube tray, freeze for approx. 12 hrs. Empty the coffee into a jug, pour in the water, leave to infuse for approx. 6 hrs. or overnight. 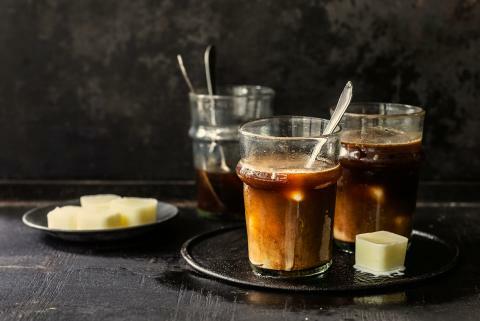 Strain the coffee, pour into glasses, add the ice cubes.